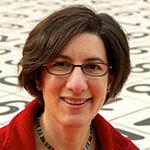 Lorrie Faith Cranor is spending her sabbatical during 2012-13 as a fellow at the STUDIO. She is working on several projects that combine her interests in privacy and security, quilting, computers, and technology. Lorrie is an Associate Professor of Computer Science and of Engineering and Public Policy at Carnegie Mellon University where she is director of the CyLab Usable Privacy and Security Laboratory (CUPS). Her research focusses on online privacy and usable security. She has played a key role in building the usable privacy and security research community, having co-edited the seminal book Security and Usability (O’Reilly 2005) and founded the Symposium On Usable Privacy and Security (SOUPS). She serves on the Board of Directors of the Electronic Frontier Foundation, The Future of Privacy Forum Advisory Board, the DARPA Privacy Panel, and the Washington University in St. Louis Department of Computer Science and Engineering External Advisory Board. Lorrie received her doctorate degree in Engineering & Policy from Washington University in St. Louis in 1996. She also holds an undergraduate degree and two masters degrees from Washington University.